Drums (and bass guitar) are the foundation of a great mix. If the drums aren’t right, the mix lacks energy and loses its impact. With all the signal processing available to us (EQ, compression and gating), it is easy to get overwhelmed. The most important thing to keep in mind is to never use signal processing just because it is available, only use it to solve a problem. Let’s go through the foundational EQ, Compression and Gating techniques for mixing live drums. 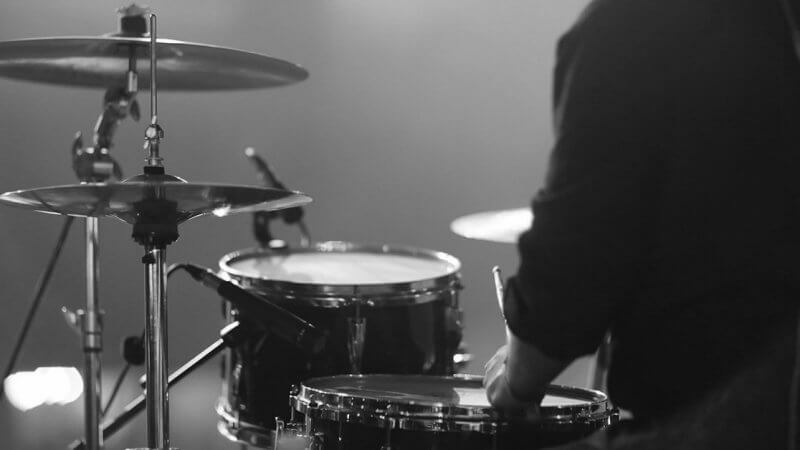 For great sounding drums, you first need to make sure your drum heads are properly tuned, mics are placed correctly and gain is set properly (more on that here). Then, a few simple EQ techniques will take your drums to a whole ‘notha level. Only use compression with inexperienced drummers. It is common for sound techs to put compression on almost every drum mic, but this is not necessary unless you have an inexperienced, uncontrolled drummer. Even in this case, you will probably only need light compression on the kick drum and possibly the snare. Most importantly, only use compression to solve a problem with volume inconsistencies. Don’t use it just because it is available. If gating isn’t needed, don’t use it. When talking to an audio engineer, especially one that works in a studio, he will recommend that the drums be fully isolated with proper gating so there is no cross-talk between the microphones. I am not going to say this is wrong altogether, but it is not the right solution for church live sound. When the drums are fully isolated and gated, it is tough to get them to fit with the rest of the mix. Think about it… When isolating, you are putting the drums in another room, so to speak, yet trying to make them sound like they are in the same room as the rest of the band. This takes some serious skill and finessing which only full-time audio techs can master. So, when should you use gating? When the floor tom is mixed so that you feel it in your chest, even the slightest head vibration will be amplified through the sound system as low frequency feedback. This is a great use for gating. Simply set the gate so that the vibrations in-between hits are not heard. If too much hi hat is coming through the snare mic, you may want to use gating. However, a better solution is to communicate with the drummer, asking him to lighten up on the hi hat. Gating the snare is tricky business – do so with caution. Currently, I am gating the top mic of the snare so that it is nice and punchy without ringing afterwards. The bottom snare mic is left wide open (no gate) so that soft snare rolls are still heard even when the gate on the top mic remains closed. We use electronic drums, a Roland TD11k to be exact. We have Soundcraft EFx 12 for mixer and yorkville Ps12 speakers and ps12 p for sub. The low end is a bit muddy. Any thoughts? Hey Ted – thanks for the comment. There are many things that can make the low end muddy, so it’d be hard for me to tell you exactly what is going on here. But, here are some things for you to try. Use a Frequency Analyzer to see what is going on your room. It’s quite possible that a small range of low frequencies is sticking out above the rest, causing them to sound muddy. Learn more here. Make sure the crossover is set correctly on your mains and subs. Use a low cut filter on all vocals to help clean up the low end from things that don’t need to be there. Learn more here. I appreciate what you guys put out, they’re great articles to send to volunteers and students. However, the “Only use compression for inexperienced drummers” line is painting with a really broad brush… You can’t achieve the “modern worship” sound without well-used, sensical compression on the kit. I feel like the “compression is dangerous, only use it if you have to” mentality keeps a lot of folks from learning and exploring what compression is actually doing to the source material. Compression is a tone control and a transient shaper as much as a “volume inconsistencies” tool. Teaching the ARRT and ¼ wave ideas helps guys understand WHAT they are hearing and WHY, and how they might want to use compression in their mixes. Great thoughts, Zach. I agree, we should all dig in and learn how to use compression. Yet, most who read these articles are volunteer sound techs with limited time available, so I try to stick to the things that will make the greatest impact. Compression is a great tool, but if you have a controlled drummer, it is ‘icing on the cake’. Dude! Thank you so much for all of your articles on EQ and sound. I’m a worship pastor at a small church, not a sound tech but we don’t have a trained sound tech and it turns out I know the most about sound (which isn’t much) in our church. I’ve always had my brother who is an amazing sound engineer with me but since he’s awesome, he’s advanced and is now the sound and media pastor at a large church in Austin, Tx. So I’ve had to step it up and learn more which is a great thing as a worship pastor to do since we are over every aspect of worship. But I’m trying to grow in this area and you have been such a huge blessing! Thank you for all you do. Thanks for the kind words, Kenny!